Banshee returns for one last brutal run; good riddance, American Idol. Season Premiere: Anyone flinching at the hand-to-hand-combat brutality of Daredevil has never seen Banshee—which is probably most of you because, you know, Cinemax. Fortunately for those suffering from Too Much TV Syndrome, Season 4 will be the last for this overlooked, gritty slice of Amish-country crime noir (stay with me), so there's hope for eventually catching up. 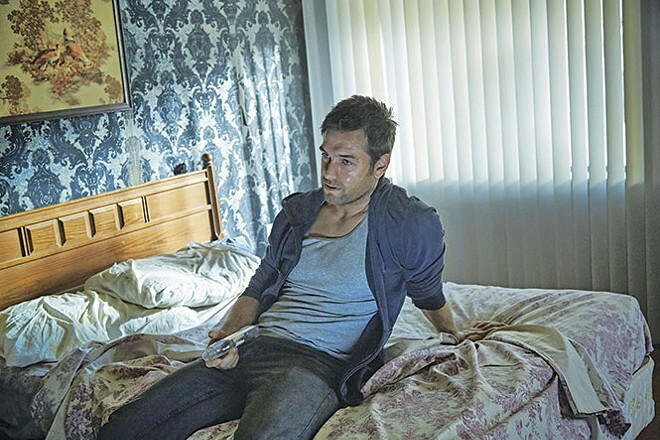 The tale of an ex-con/thief (Antony Starr) who assumes the identity of Sheriff Lucas Hood en route to tracking down his former partner/girlfriend (Ivana Milicevic), who's hiding out in the small town of Banshee, Pa., has taken many a bizarre turn, but the outcome is always the same (and bloody): The local Amish mafia, Native Americans, skinheads and even some of Hood's own police force, would like him gone and/or dead. Season 4 picks up two years after the events of Season 3's shattering finale—Banshee isn't a jump-in-anywhere story; do not attempt—with Eliza Dushku joining the fray as an FBI profiler who may be just as effed-up as Hood. Banshee is a wild ride; add it to your TV homework. Movie: "From the makers of Sharknado ... Say 'Bye Bye Bye' to zombies!" Yes, it's for real: a zombie-apocalypse Western starring various members of '90s boy bands *NSYNC, Backstreet Boys, O-Town and 98 Degrees (sorry, Color Me Badd do not represent). Aside from the admittedly slick gimmick, there's little about Dead 7 that The Asylum's Syfy zombie series Z Nation doesn't do better/funnier, but rookie horror writer Nick Carter (of the Backstreet Boys, who also stars) at least deserves credit for keeping this slab of cheese somewhat coherent. Emphasis on "somewhat," since none of the boy-banders can act, and there's an incongruent Mad Max element thrown in because, well, why the hell not? Also: cameos by Jon Secada(!) and Everclear's Art Alexakis(!!). Series Debut: It only sounds ridiculous because it is: Wynonna Earp (Melanie Scrofano) is a modern-day descendent of Old West gunslinger Wyatt Earp, who was also a supernatural demon hunter. Now it's Wynonna's turn, as she returns to her hometown of Purgatory to re-smite the evil souls (or Revenants) taken down once upon a time by Great Grandpappy—with an assist from the now-immortal Doc Holliday, of course. Wynonna Earp holds true enough to the '90s IDW comic-book source material, and Scrofano easily brings her to life as a likeable combo of badass and goofball. Another winner from Syfy—hopefully, the Dead 7 lead-in will draw some eyeballs, because Wynonna has no established support series on Fridays after tonight. Return: After a decade away, Blossom, Bubbles and Buttercup are back! (We're going to pretend that ill-advised 2014 Powerpuff Girls 3-D special, made with no input from series creator/writer/director Craig McCracken, never happened.) Likewise, The Powerpuff Girls 2016 won't involve McCracken, but it does have his approval; aside from some new voice talent and a refreshed theme song from indie-rockers Tacocat, they're still the same pint-sized Townsville superheroines saving the world before bedtime. Is Cartoon Network taking reboot requests? My comeback wish list: Sheep in the Big City, Grim & Evil and, most of all, Space Ghost Coast to Coast—SG is truly a hero for our modern times. Special: It's been 14 years since American Idol was launched as a $inister initiative to destroy music, a product-placement garbage cannon inspiring millions of karaoke dropouts to eschew hard work and talent in favor of jumping a cattle-call train to Overnight Sensationville. Burn in hell, Simon Fuller, Simon Cowell and Ryan Seacrest. American Idol: American Dream (ha!) looks back on 15 seasons of pop failure dotted with the occasional bona-fide talents who likely would have become stars on their own (there's a reason Carrie Underwood plays the EnormoDome while Taylor Hicks headlines boat shows). Again, burn in hell, Simon Fuller, Simon Cowell and Ryan Seacrest. The merciful end of American Idol is at hand, but the damage is done, and our tone-deaf Precious Snowflakes who've been conditioned to believe they crap rainbows still have an open mic on The Voice. One last time: Burn in hell, Simon Fuller, Simon Cowell and Ryan Seacrest. Listen to Bill Mondays at 8 a.m. on X96 Radio From Hell and on the TV Tan podcast via iTunes, Stitcher and BillFrost.tv.